La Paz is the administrative capital of Bolivia, and sits at an altitude of 3,500 m. The city has a backdrop of snow capped mountains, the highest being Mt Illimani which has a height of 6,438 m. This city is well known for good food, politics shopping and something called cholita wrestling. We arrived in La Paz after an overnight bus. The weather was miserable so unfortunately we couldn’t see any snow on the surrounding mountains. We could see the difference between this city and the other Bolivian cities we had been too instantly. La Paz was more well kept and had more Spanish influence. However saying that, all the houses on the hill were still made out of facebrick and clay. After dropping our bags at our hostel we headed to the walking tour. We started this tour at San Pedro Plaza just outside of the prison. This prison is famous for being its own society. The prisoners have jobs, rent their apartment, shop and have their families live with them all inside of the prison walls. The prison is also notoriously famous for all of the cocaine that is traded to the prisoners and sold to people who visit the prison. We then walked though Rodriguez Market looking at all the fresh produce being sold and the women in their traditional outfits. 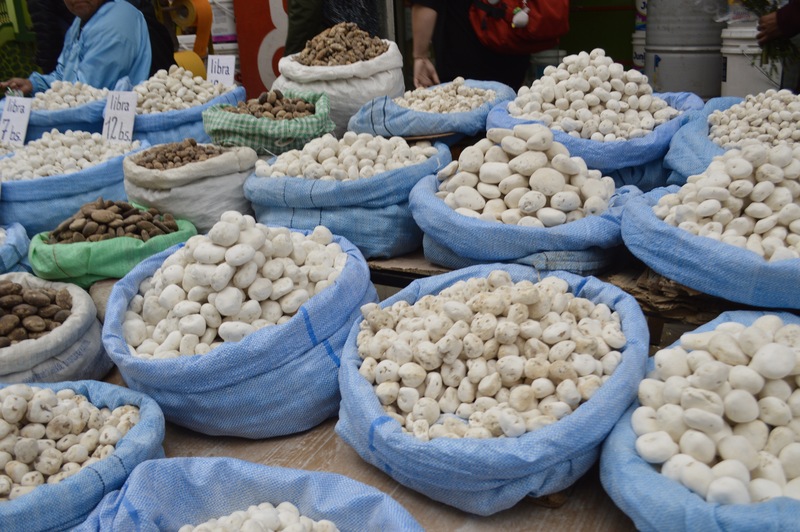 One of the things I have found most fascinating about Bolivia is that there are approximately 1,550 different varieties of potato. We then went to the witches market. The witches market or as the locals refer to it, El Mercado de las Brujas, is a market in which witch doctors sell goods used in Bolivian rituals. The witch doctors, who are referred to as yatiris, can be spotted as they are usually wearing black hats and powders around their necks. One of the most common things bought at this market are llama fetuses. These fetuses must have died from natural causes and are buried under new small buildings as an offering to Pachamama. Pachamama is the Mother of Earth according to the indigenous Andean people, the Aymaras. By offering a llama fetus to this goddess, people believe that she will protect the builders and the people who are to inhabit the building. Aymara people are indigenous to the Andes regions in Bolivia, Peru, Chile and Argentina. 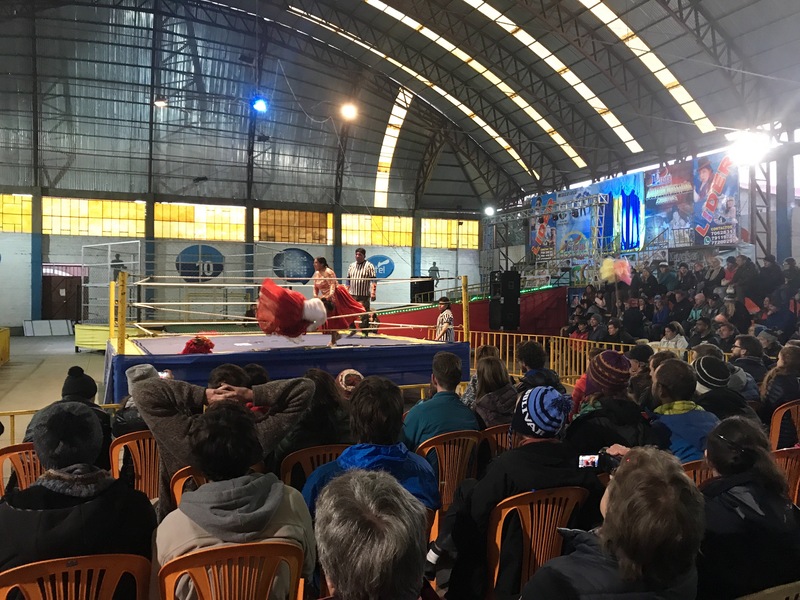 Over a tenth of Bolivia’s population are Aymara, and therefore there is still a strong belief in Pachamama. The Aymara people have their own flag called the Wiphala. This flag is a squared shape with seven different colors in it. Courts and I have seen this flag everywhere and have always been curious as to what it was. This flag is in fact now the dual flag along with the red, yellow and green flag for Bolivia. At the witches market we saw llama fetuses, however this market was strange as it was in between a tourist souvenir market. Our tour guides proceeded to tell us of an urban legend with regards to larger buildings. The legend states that for larger buildings a larger offering must be made to Pachamama, and this usually includes a human sacrifice. A homeless man is sought out and buried alive in concrete. Even though this was only an urban legend, we all left the witches market feeling uneasy. We then went to San Francisco Church. 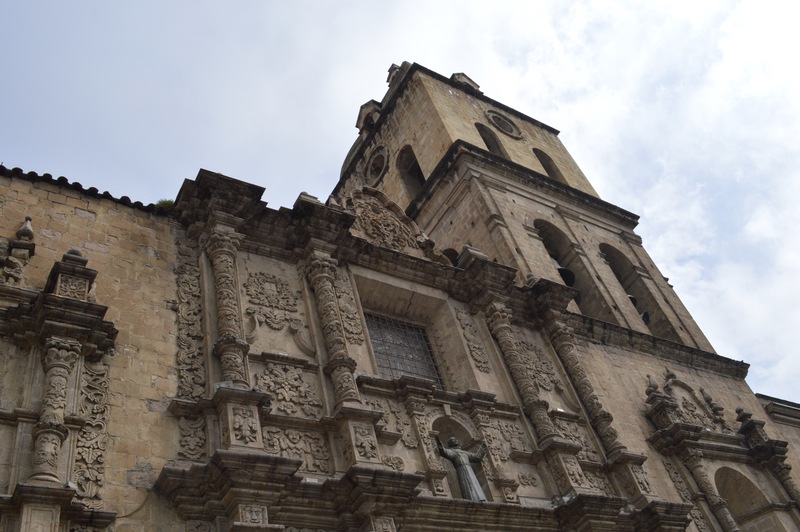 This church was beautiful and surrounded by people selling snacks and drinks. We subsequently learnt about the political history of the country at Plaza Murrillo. The presidential palace, national congress of Bolivia and the Cathedral of La Paz are all in this plaza. We finished the tour at Sol y Luna by having a shot of traditional Bolivian alcohol, singani and discussing the current president. 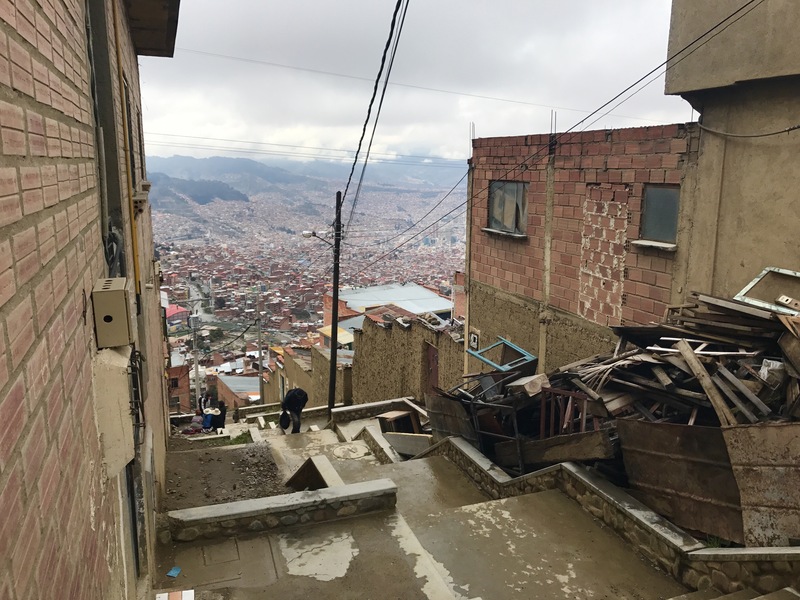 This tour was interesting, but I felt I wanted to learn more about the history of Bolivia, as in our travels we have seen such a contrast between poverty, wealth, cities and nature. 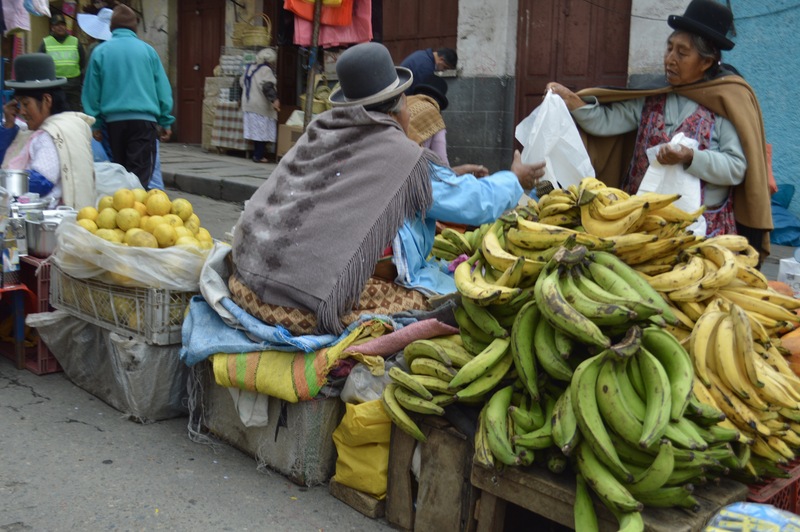 Watching the Bolivian women conduct their daily business. Trying to spot as many different types of potatoes as possible. Our guide explaining the witches market to us. The beautiful San Francisco Church. We woke up and went to the local food market and grabbed a sandwich and coffee. We then met up with a fellow South African, Kelly and an Australian, Lee-Anne. La Paz has no subway system, instead they have Mi Teleférico. 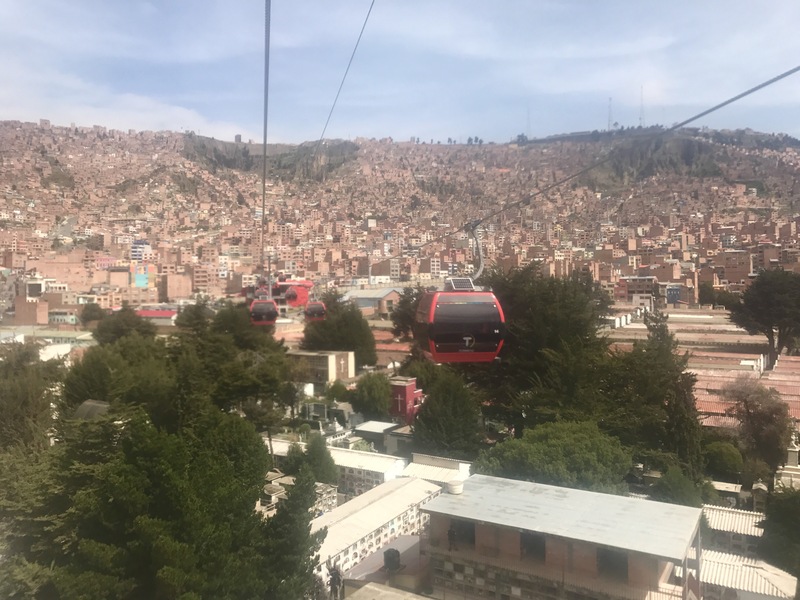 This is a cable car sytem that connects La Paz to the surrounding city El Alto. El Alto is the second largest city in Bolivia and has an altitude of 4,150 m. This is the highest major metropolis in the world. Currently there are three cable car lines running and another six that are either being built or in the planning stages of being built. We paid R12 (USD 0.80) for the round trip on the red line to El Alto. We walked out of the cable car station and instantly found the largest flea market in South America, the Plaza 16 del Julio Market. This market is not a tourist attraction but we still found it interesting to see what was being sold. You could buy any car part you wanted, clothing, electronics, carpets, stationary, food and essentially any other item you might need to live in and around La Paz and El Alto. This market was filled with people and strange smells, but the views from the market were beautiful. The red cable car line connecting La Paz to El Alto. Thousands of stores were accompanied by tens of thousands of people shopping. 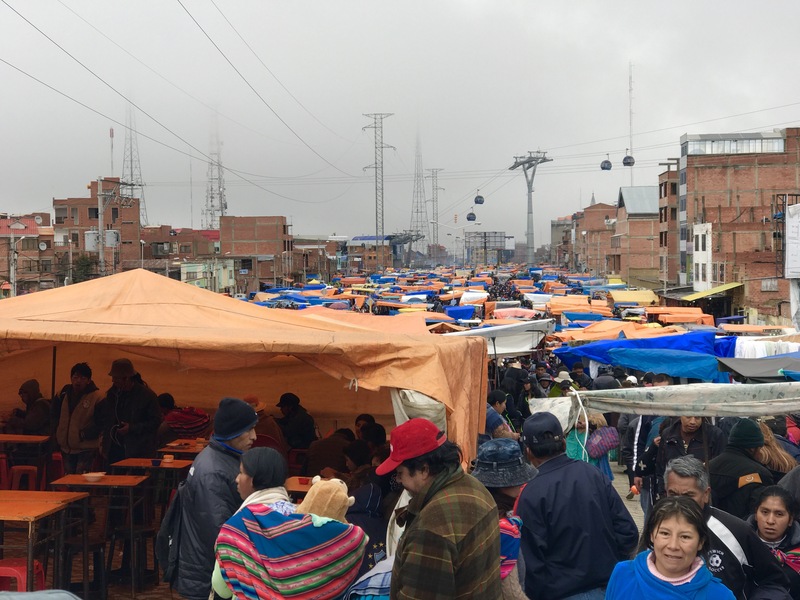 The beautiful view from the market in El Alto. 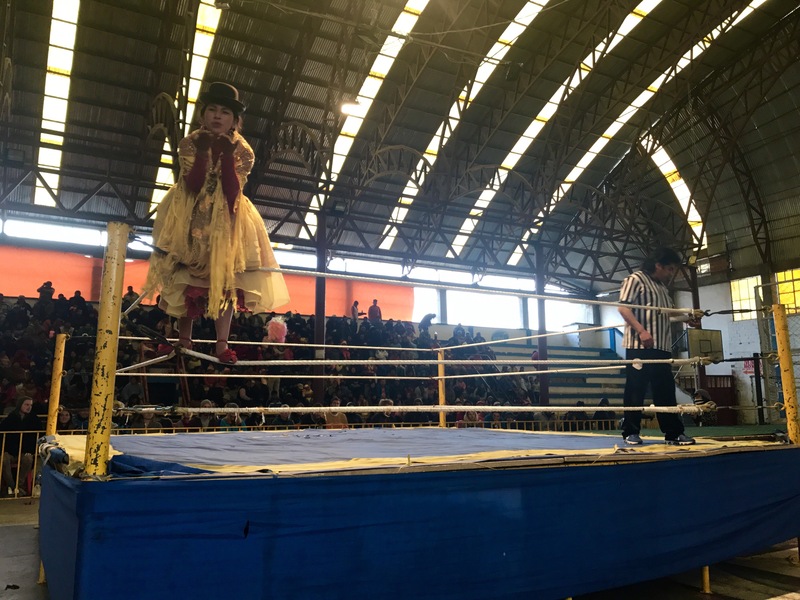 In El Alto, there is a special sport known as Cholita Wrestling. 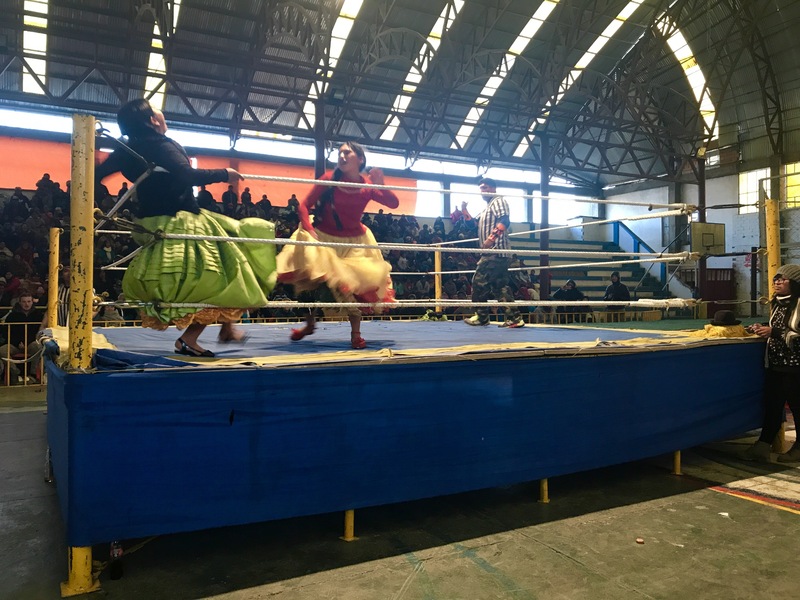 This sport is where two women wrestle while wearing their traditional Bolivian chlothing. This sport can also include men, and is completely staged. We booked this tour through the same company we did the walking tour with. Watching this sport is only available on Thursdays and Sundays. While the acting proved entertaining at times, we could not deny that they had some acrobatic skill. Even though this was an interesting experience, I don’t know if I would recommend it to people. Showing off before her ‘big fight’. Although this was staged, some moves looked incredibly real. Things escalated to outside of the ring. Courtney and I playing tourist with the Cholitas. 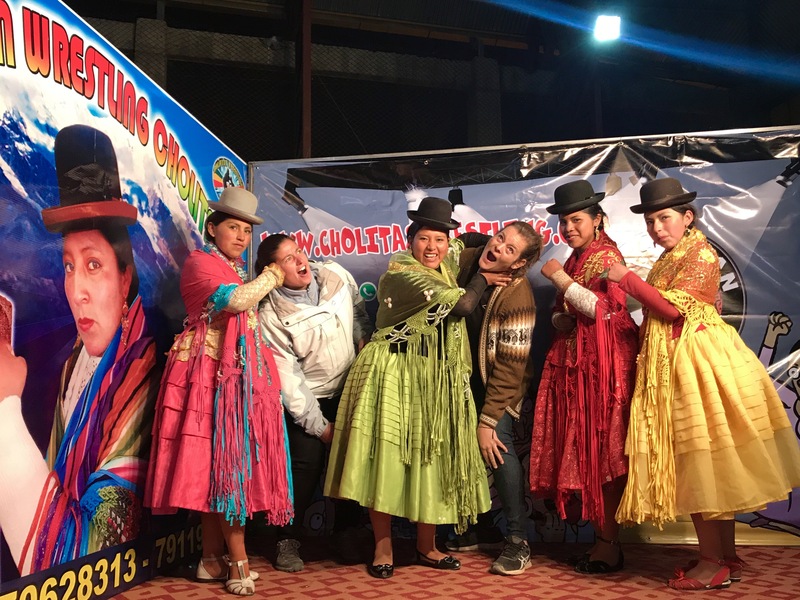 Our time in La Paz and El Alto was filled with markets and learning about strange local customs. 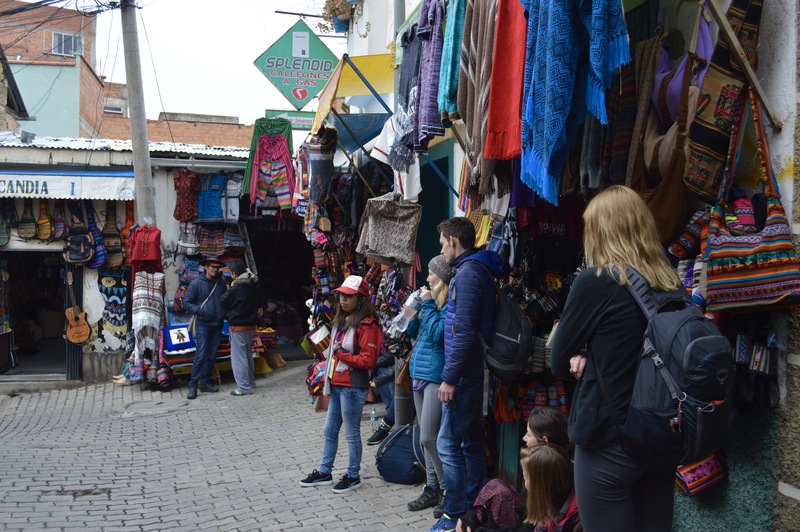 La Paz was definitely the most developed out of the cities we have visited in Bolivia, and the history we learnt about was interesting. I would suggest that three days is enough to explore both cities. Next postCoroico: It might kill you to get there but the views are worth it!